The St. Andrew’s Society of Detroit is celebrating the 169th anniversary of its annual Highland Games, the longest continuous running Scottish festival of its kind in North America, at Greenmead Historical Park in Livonia, MI. The Games are visited by people of all heritages throughout the U.S. and Canada. St. Andrew’s Society of Detroit is a volunteer-based nonprofit organization that produces the Highland Games. This year’s Games will feature a delightful combination of Scottish history, pageantry, athleticism and good old-fashioned Celtic fun. Some of the many scheduled activities include: heavy athletics professional invitational, solo bagpipe and bagpipe band competitions, drum major and drumming competition, highland dance competition, Tug O’War, Wee Bairns Area (games for children ages 4-11), genealogy and clan tents and live entertainment tent featuring MudMen, Albannach, Stone Clover and Stone Clover. 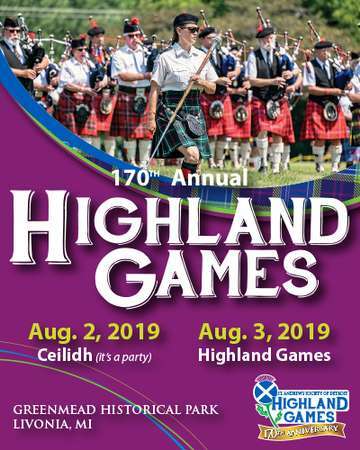 Please join us in celebrating our 170th anniversary on Friday, August 3, from 5 to 11 pm, at our Ceilidh (pronounced Kay-Lee) and on Saturday, August 4, from 8:30am - 7:00pm at our 169th Annual Highland Games. **NOTE: All online ticket sales end at 6pm on Thursday, August 2, 2018. You may still purchase tickets at the gate. All tickets are non-refundable. For more information on the highland games, visit our website highlandgames.com. Find us on Facebook at facebook.com/SASDhighlandgames.